The 42nd episode of THE FIRE AND WATER PODCAST is now available for your listening pleasure! THE FIRE AND WATER PODCAST is the official podcast of FIRESTORM FAN and THE AQUAMAN SHRINE. It’s a New 52apalooza! Shag and Rob discuss Justice League #16 (by Geoff Johns, Ivan Reis, Joe Prado, and Rod Reis), Aquaman #16 (by Geoff Johns, Paul Pelletier, Sean Parsons, and Rod Reis), and The Fury of Firestorm: The Nuclear Man #16 (by Dan Jurgens, Ray McCarthy, Karl Kesel, and Hi-Fi)! You can find the 42nd episode of THE FIRE AND WATER PODCAST on iTunes. While you’re there, please drop us a review on the iTunes page. Every comment helps! Alternatively, you may download the podcast by right-clicking here, choosing “Save Target/Link As”, and selecting a location on your computer to save the file (31 MB). 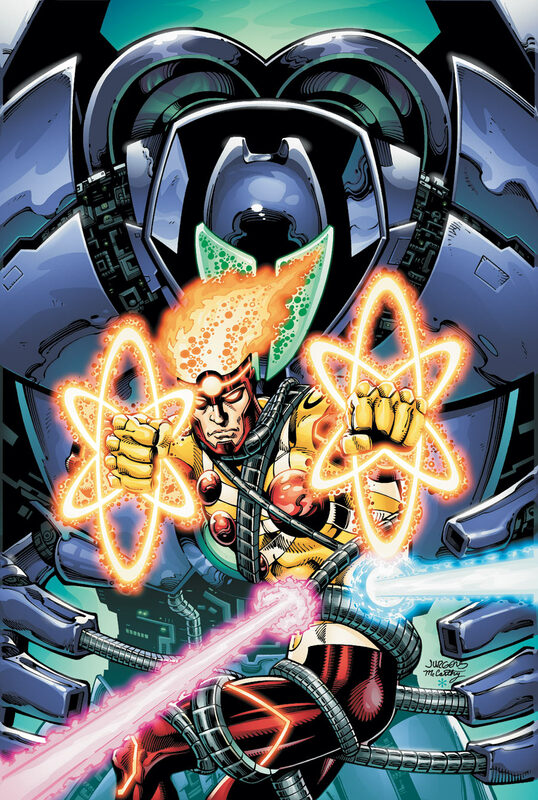 Check out below the captivating cover art to The Fury of Firestorm: The Nuclear Man #16! Click to enlarge! Vibe is the new Access, isn’t he? You do know Slipknot will be maimed in his first new appearance, don’t you? In other news: Just got the announcement that the Gerry Conway interview got its backing and that my credit card has been charged. So we did it! That’ll be if it flops. A great episode Shag. Commenting here since I’m always on the Shrine. The lead Trench that Aquaman battled in AQ 1-4 has been transformed…he stands out on the double-page splash…betting we’ll be seeing more of him. King Trench, anyone? Also thanks for helping Rob identify the new female Atom (we did cover that on the Shrine back on FCBD 2012, haha! I agree with you totes on Johns writing Batman as way too gabby and while Rob loved the interaction between Bruce & Arthur, I kinda hated it, feeling it was a lot of expository dialogue. I did not get a B&B vibe at all. And speaking of Vibe (see what I did there) I encourage you and all your individual blogger league friends to check out JLA #1 — its going to knock your socks off big time, and that’s coming from someone who was originally very skeptical of the book. Vibe is going to be a baller in the DCU & Johns is going to do “justice” to Hawkman, Green Arrow, & Martian Manhunter. Trust me on this. Finally, rumors abound that along with Hawkman, Firestorm may be cancelled in May. Look for confirmation (or not) around Monday the 18th when DC releases its May solicits. Wow, guys, if I needed *any* more proof that we are all on the same mental wavelength, when Shag asked for a “hell ya” during this pod-cast I actually did in fact give you one!!! !…..then was personally thanked by you for doing so! TOO WEIRD and I laughed out loud for about a minute. Great podcast, guys. I hope the rumors about Firestorm’s cancellation, while not entirely unexpected, are not true. Just one thing for Shag— I don’t think Firestorm is based in Pittsburgh anymore (mentioned twice in the podcast). I believe they are based in the fictitious city of Walton Mills. Damn It! New Zealand’s shipment has been delayed, I still havnt read these books yet. So I cant listen to the podcast, until after I read the books! Curse you Shipment delays! Is Frank okay? Where’s his usual rantings and ravings for this ep? I miss them. Sean, in the absence of listener feedback, the podcast failed to recite my name three times to unlock Diabolu-Mode. It took you to cast the spell! 1. That “Adams” Superman money shot was fantastic, aside from its featuring the stupid New 52 glowing piping. 2. Oh good– Cyborg creates a whole subplot to attempt to grandstand for reader affection while other heroes just show up and dig in. I’m so impressed, Victor “Titans Jobber Forever” Stone. Prediction: Deux ex Cyborga to wrap things up after Aquaman does all of the heavy lifting. 3. Vixen is sadly not part of Vibe’s Justice League of America. Stupid Catwoman. 4. *^(% Red Tornado, too. Awful character. What are they paying you, Appologist Kelly? 7. So we’ve long been playing with the theme of the Atom and Hawkman being buddies since they had a Power Man & Iron Fist-style joining of two flailing titles for a year in the 1960s. Neither have had much more luck since, but each of their series seems to find at least a moment to acknowledge the friendship. Ryan Choi took on the Atom mantle, and was a lil’ buddy to the Winged Wonder as well. So… now the Atom is going to be a girl, right? How exactly does that change the dynamic of the relationship in the New 52, especially in light of the absence of a Hawkgirl/Woman on the main Earth? Will they now be… buddies? 8. In thirty-some years, Katana has never been anything more than a one-dimensional stereotype who did for Elektra what the Lawrence Welch singers did for soul music. That said, she’s an Asian heroine with no male predecessor backed by a long and surprisingly reasonable publishing history. That is extremely rare in comics generally, much less whitebread DC ones. I respect Ann Nocenti as her new writer, really enjoy the covers by Finch and Ryp, and hope that Katana brings a new flavor (and hopefully more depth) to a modern, representational Justice League of America. Diabolu-Mode activate! Awesome! It’s like getting an achievement on Xbox, but without the actuality of really achieving anything.